When I’m on my way home and I walk by my favorite burger deli, I feel like I’m part of one of Pawlow’s experiments. My mouth starts watering even before I see any food; the mere sight of this nicely designed window makes me completely forget my intention to start a healthier diet. Unbalanced it shall be! It has become a weekly routine to stop there and try their latest creations. And there are lots of them! Liberty Delis has the most multifarious variety of burgers you can imagine. You can have everything from grilled chicken, Angus beef and bison to wild combinations of whisky-plum-BBQ-sauce, boar petty with cowberries, or selfmade hot-spiced-wine-sallow-thorn-marmelade. Sauerkraut is one of the less surprising toppings you can choose from – and that should mean something. If you don’t feel like trying out something new, you can just stick to the good old classics and choose from tasty side dishes like fries, sweetpotato fries, or wedges with a variety of dips. I’d also recommend the homemade chilli. Everything is so juicy, even my eyes start to water when I take the first bite: it’s that awesome. When I don’t feel like trying something new, I just order the Cheeseburger, which never fails to make me happy. 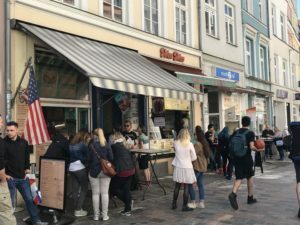 I think most of the customers just order the evergreens, because: „Was der Bauer nicht kennt, das frisst er nicht!“ That’s the Northern spirit. Another plus is that the quality of the products is important to the owner. The meat is organic and local, which might be interesting for burger-lovers who forgo their desire to oppose industrial livestock farming. A local bakery also supports the delis and delivers fresh buns every day. To sum it all: you need to try it. Seriously. 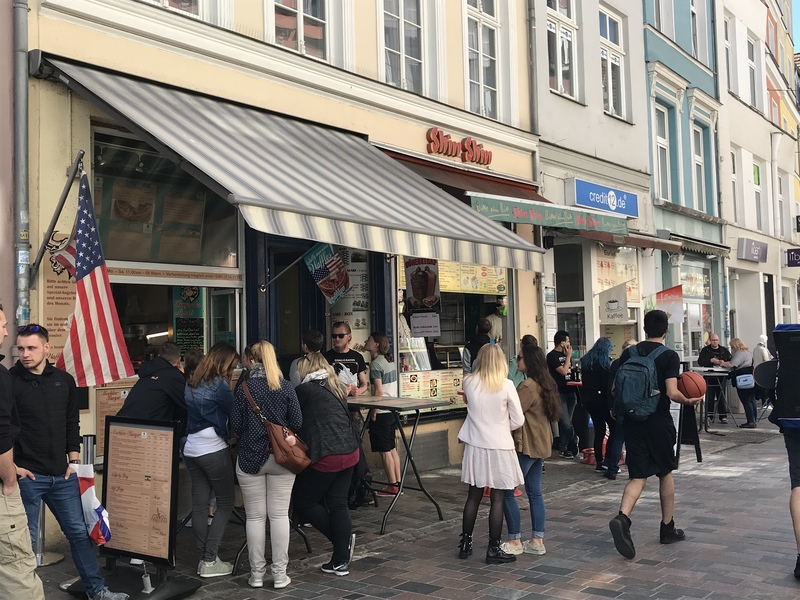 This entry was posted in Germany&MV: Do's & Don'ts, Local Lifestyle, M-V, Restaurants, Bakeries & Canteens, Rostock & MV, Rostock Reviews, Where 2 Eat/Drink/Go Out. Bookmark the permalink.